Abstract Ideas | And mightymouse pronounced . . . . You Must Create! 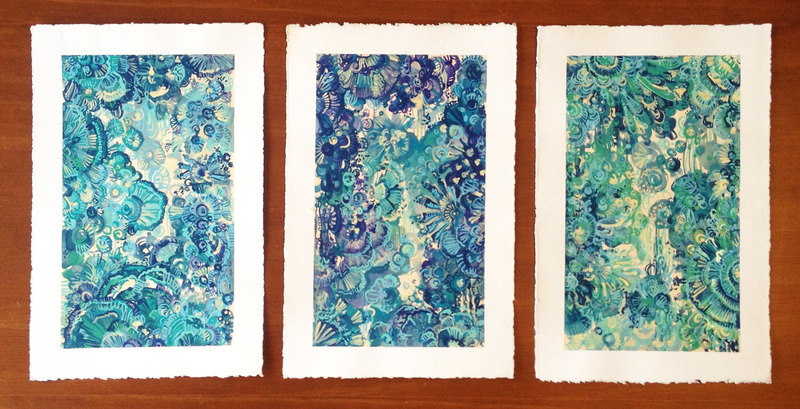 Inspired by Paua shells and others such treasures found in rockpools, I opted for blues, greens and purples. With a soft tea stain as the background base. They’re a bit different from my usual works, but perfect considering the headspace I’ve been in lately, which feels rather rough and turbulent – The way waves pick up small objects to toss them around and discard at random along the shore. I’ve just put them up on my Felt Sale shop if you are interested. Enjoy!